If funded, Heavy Gear Assault will use virtual reality to make players feel like actual Mech pilots. The Oculus Rift is a fascinating piece of technology, but until everybody has one, we can't be sure it's an appropriate fit for each genre. After all, the Rift is a VR headset and not a holodeck; odds are most players will be sitting comfortably with a controller in hand, experiencing a slight disconnect between their perceptions and reality. That said, the Rift could be very effective in mecha and flight sim genres, where both players and avatars are seated while driving their chosen vehicles. CCP provided a great example with its EVE-inspired space combat demo, and now Stompy Bot Productions intends to adopt the technology as well. The developer has officially announced that, if its Heavy Gear Assault Kickstarter is funded, the game will launch with Oculus Rift support to help players feel like honest-to-God mech pilots. 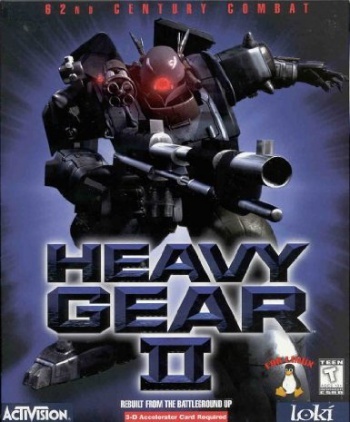 The original Heavy Gear videogames, and the tabletop versions before them, depict a war fought between human-piloted "gears" on the colony world of Terra Nova. Stompy Bot's Heavy Gear Assault is set in the universe's competitive dueling circuit, where players engage in arena-based multiplayer matches to earn honor, fame, and fortune. Stompy Bot has also revealed that it will include single-player chapters as stretch goals, with each "episode" depicting a mission from previous games or the universe's established lore. Personally, I think mecha games are a great direction for the Oculus Rift to take. While the headset certainly feels immersive, trying to represent natural human movement is more complicated, sometimes disorienting players or triggering full-blown nausea. The Rift sounds like a more natural fit for the somewhat-niche piloting genre, suiting its games the same way joysticks did for the era of flight simulators. We won't know yet how effectively Stompy Bot can implement the technology, since Heavy Gear Assault still has another $770,000 to raise before continuing the discussion. In the meantime, hopefully teams like Hawken's Meteor Entertainment will fill in the gaps, making us feel like the pilots we aren't.